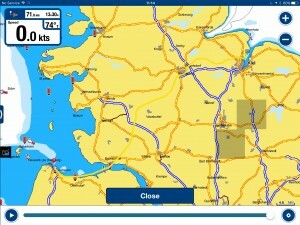 We are in Cuxhaven in a good berth. I had supper with Claus and Christiane. 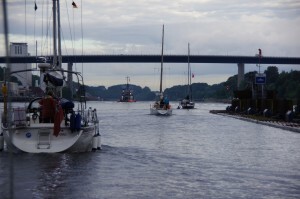 Their boat entered the lock at Kiel at the same time as us this morning. They had been kind and helpful. 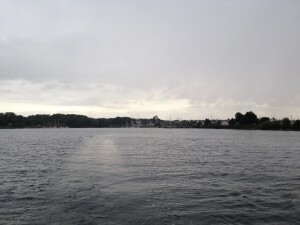 We were through the canal and leaving the lock at Brunsbuttel at 1735 local time and then experienced the very worst seamanship from a professional. 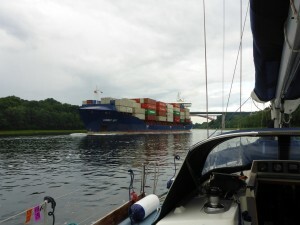 I wanted to get us over to the west side of the Elbe and out of the shipping lane and follow the starboard marks all the way to Cuxhaven. 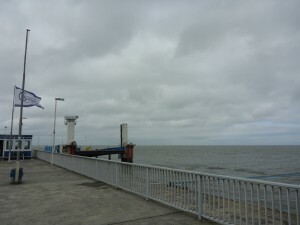 I was worried about falling foul of the German marine police and even crossed on a heading at right angles to the channel. Half way across, a tug came up fast on our port quarter from Brunsbuttel, overtook us and immediately turned sharply across our bow. Without our immediate evasive action of turning hard to starboard and cutting the throttle there would have been a collision. The tug double backed on itself to meet the ship coming up the estuary. There was absolutely no need to come anywhere near us! Klaus and Christiana say this is normal. You are the amateur, they are the working professionals! It’s actually simple. 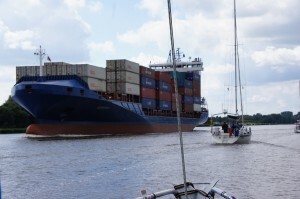 The tug driver has no pride in being a professional and AS a professional seaman setting an exemplary example. It is very sad that a professional can so blatantly ignore one of the most basic collision regulations. I feel sad for this COMPLETE idiot. He ridicules himself! It was an utterly unnecessary manoeuvre. What was he trying to prove? I add to that being ignored by ‘Canal 1’ on channel 13 at the lock. No courtesy. Again, I am told this is normal. The weather is awful today. 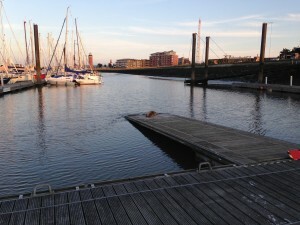 Yesterday evening we reversed in to the berth to make sure we were bows to the west for the weather that was coming in. I am not sure how long we are going to be here. Some time! The canal was a long day. 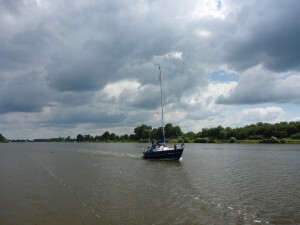 We motored through the canal in the company of two of the boats we had entered the lock with until I felt there was a possibility of making the lock in time to catch the last of the ebb down the Elbe to Cuxhaven. 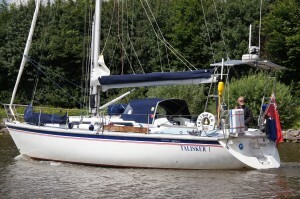 One of the yachts, a small, but proper yacht, an LM 22 had kept up with us. We took pictures of each other. We passed mobile telephones to each other and a few minutes later Andreas Whatapp’t some pictures. 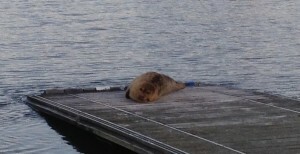 Not being nearly so clever I said I would send him pictures when ashore. 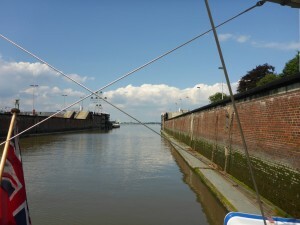 In the end we entered the lock well ahead of the others at 1705 local time. 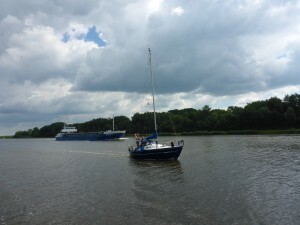 The other two boats joined us in the lock along with two other yachts some twenty minutes later so we need not have hurried. 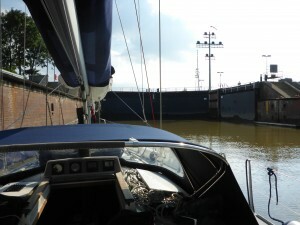 We left the lock and arrived engine off Cuxhaven at 1945 local time still in the company of the same two boats. 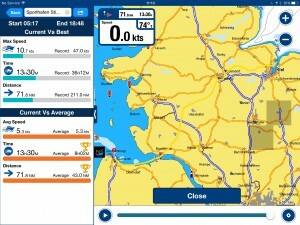 The ebb was still running hard and our speed over the ground had touched 9 to 10 knots. It’s still blowing a F5 from the west today! And to show how muddled my mind was over the last few days I wished my brother a happy birthday again, thinking it was still the beginning of July! No further comment required. Claus drove me to get some fuel and Christiane then took me to the super market. They have both been generous with their time. I’ve just met a couple who have been cruising since 2014. They did Biscay in October 2014. They have been a long way! 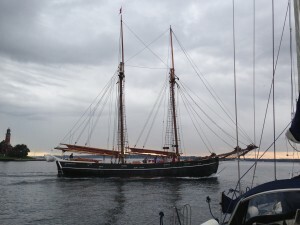 Madeira, Caribbean, Eastern Seaboard, Azores and then sailed straight home to Cuxhaven from Plymouth via Falmouth. They arrived back on Saturday. I asked when they were going back to work. 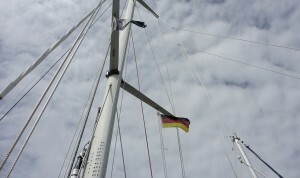 He has been working for a German Yachting magazine while sailing. So full time employment for him. He now gives up work. 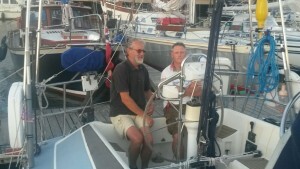 They go back to the Bahamas shortly to a Catamaran they have bought to do charters. 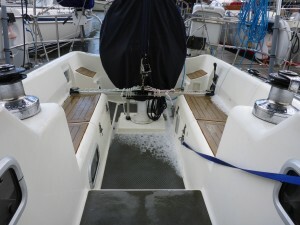 The boat they did the voyage in goes in to storage … inside! They were decorating their boat with the flags of every country they have been to. I have Scotland, Norway and Denmark hanging in the cabin. It does not quite match their abundance of flags. 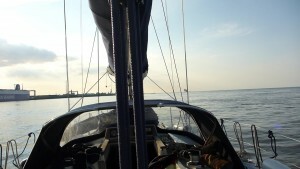 Thinking ahead, I might sail straight to ………………… Borkum from here. Yesterday evening I had a long talk with Mum. I was surprised and then thinking about it afterwards, not surprised just how much she understands about the sail we have done this summer. She is very astute and sharp and fully realises that a trip like this is not the easiest thing to do. 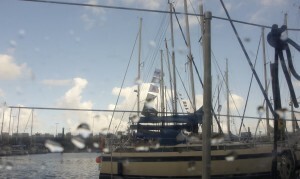 Mum emphasised that I must sail home when it is right and NOT before. There is no hurry. For really a non sailor (she would have been a good sailor) she understands very much more than she should. 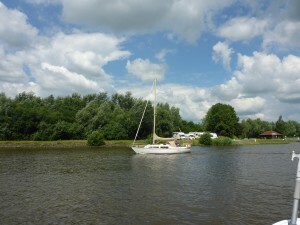 Yesterday afternoon the owner of the small yacht from the canal picked me up by car. 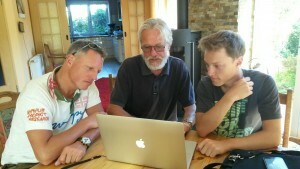 I had a wonderful and very interesting afternoon and early evening with Andreas Ittner and his lovely family. They warmly welcomed me in to their home for coffee and cakes and we swapped the pictures we had each taken on the 2nd August in the canal. 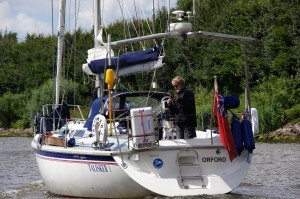 Andreas and son Fynn had been on board for the canal. 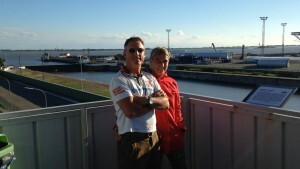 Andreas’s wife Antje and daughter Nell had driven back from Kiel by car. 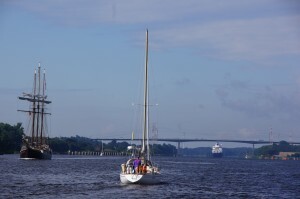 They are totally new to sailing. I think they have had the boat about a year. I am so impressed. 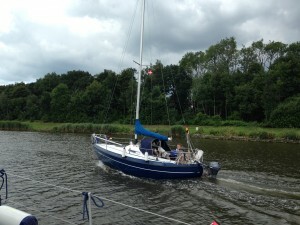 All four + small dog have had 3 weeks sailing in southern Denmark around Fyn. 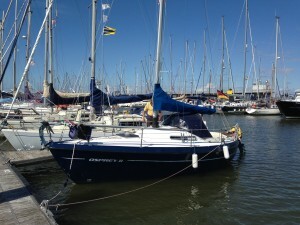 Andreas cleverly planned for the whole family to start from Kiel so delivered the yacht there a few days before. 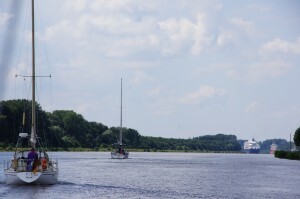 They then took their car to Kiel to begin the cruise. They were all happy at the end of the holiday, which says volumes for them as a family and for the planning. 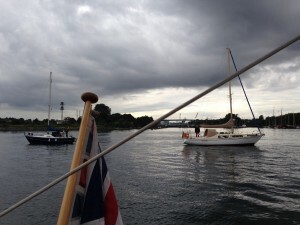 Andreas told me they never sailed for more than three to four hours. Every few days they had a nights break in a hotel. Wherever they went Andreas was always thinking about having to get back. So nobody was going to be put off by the mistake of an over ambitious passage. Andreas obviously loves it. Fynn told me he could take it or leave it. Antje is apprehensive and Nell says she really likes sailing. Andreas is already thinking and planning like someone with more experience. Well done the skipper and all of them. As my mate Bill would say ‘Good Skills’. 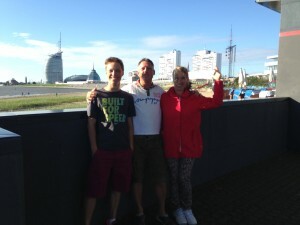 Andreas and Antje drove me around Brumahaven and then the half hour back to Cuxhaven. 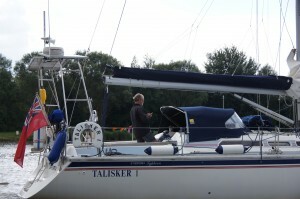 They came on board ‘Talisker 1’. 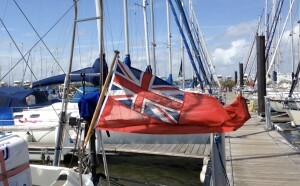 They are lovely people and will have fun sailing. Andreas, an x marine and now a fire fighter, has the right attitude. At about 9.30 last night I got a text from Claus and Christiane inviting me to watch the spectacular fire work display near the harbour with them. Their 23-year-old son was with them. He was a patient of Antje (a physiotherapist), while recovering from a nasty broken leg. Claus taught Antje briefly when he was contemplating teaching 25 years ago. Everyone knows everyone. As a final thought I told Mum about the support from Doc and James R. Their messages and texts have been enormously uplifting when I have been questioning my ability to complete the trip. 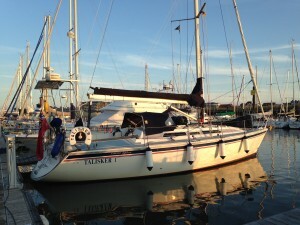 I have just returned to ‘Talisker 1’ after two nights in Hamburg. No shortage of money in a vibrant city. My friend Charles Craske lived in the city for quite a time and loved it. I managed a last minute deal at quite a smart hotel near the station. A minutes walk with a bag. A hot shower that did not turn off automatically was welcome! 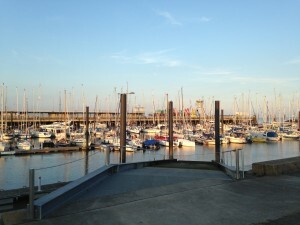 The marina showers switch off after their allotted four-minutes! The Germans do everything rather well. Like their football! Hamburg was rainy but I walked a long way round the city. Like Paris, get just outside the centre and there are interesting places to sit and eat and watch the world go by. I am really hopeful about the weather. At the moment it looks possible to escape on Sunday and then the wind is supposed to blow in the right direction although it will be light at times. I COULD just be home by the end of the week. It will all change again ….